Peanut Capsicum Masala, this is my first try with capsicum as a side dish. 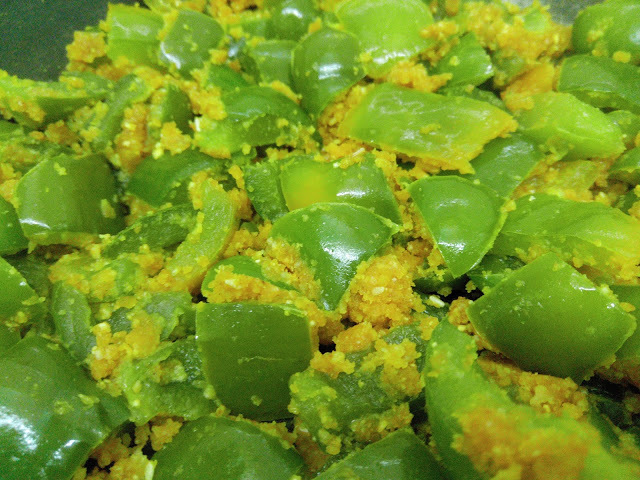 I usually use capsicum only for preparing Chinese items like Manchurian, fried rice, noodles, etc. But, this time I tried as a side dish. I don't remember where did I come across this dish but it turned out really well. Generally, my hubby don't like capsicum much. This time to my surprise, he loved it. Hope you'll also try this out and post me your comments. 1. Capsicum - 2 Nos. 2. Roasted Peanut - 2 tbsp. 3. Coconut - 2 tbsp. 4. Sesame seeds (Ellu) - 1/2 tsp. 5. Fried gram (Pottu kadalai) - 1 tsp. 6. Chili powder - 1 tsp. 10. Oil - 1 tsp. 1. Dry roast Peanuts, Sesame seeds, Fried gram and Coconut separately and keep aside. 2. Cut Capsicums into small square shape pieces. 3. Heat Oil in a kadai and add Capsicum pieces and fry for few minutes. 4. Add salt. turmeric powder and chili powder and mix well. 5. Close with a lid a cook on medium flame for 5 mins. Note - No need to add water. 6. Grind the dry roasted items to make a powder. 7. Once the capsicum is cooked, add the ground powder and toss well. 8. Switch off the flame once the capsicum and the powder are mixed well. 9. Peanut Capsicum Masala is ready to serve.